Nutritious food and hydration are an essential component of physical and mental well-being. We can always make simple changes to improve our own and our families’ nutrition and hydration. ‘Nutrition is the intake of food, considered in relation to the body’s dietary needs. Good nutrition – an adequate, well balanced diet combined with regular physical activity – is a cornerstone of good health. Poor nutrition can lead to reduced immunity, increased susceptibility to disease, impaired physical and mental development, and reduced productivity’ (World Health Organization). If you are vegetarian your omega 3 sources would be flaxseed (linseed) oil, walnuts, soya oil and soya based foods. Your body requires water to function, 70% of your body is made up of water and it contributes to the maintenance of normal cognitive and physical functions. Lack of water can cause dehydration, tiredness, headaches, dizziness and constipation. 70-80% of the daily water intake should come from drinks, and the remaining 20-30% should come from food. Water contains no calories, no sugars and is tooth friendly therefore aiming for 6-8 glasses of fluid per day is good. Herbal teas, milk, fruit juices and smoothies are alternative fluid options but can contain calories with the sugar content. If you or your child don’t like drinking water try flavouring water with fresh mint, cucumber, slices of lemon or fruit, try cold or hot water, attractive reusable water bottles that can be refilled frequently or herbal teas. Opt for no added sugar squash, fresh fruit smoothies and fruit juices and dilute them with more water. Balanced diet, good hydration and regular exercise can lead your way to a healthier you as well as cutting back on the sugars, processed foods, foods high in saturated fats and salt. This can also assist in reducing your risk of developing common lifestyle diseases such as diabetes, heart disease, high blood pressure and cholesterol. Are you lacking motivation and want to get fit and healthy? Then pick up the phone and speak to our ONE YOU HOUNSLOW TEAM who can help you reach your goals. From zumba, health walks, yoga or cooking sessions we offer a range of services that can help you get fit and feel good – pick up the phone and dial 020 8973 3530! Combine all the salsa ingredients together in a bowl and season with salt and pepper then set aside to let the flavour develop. 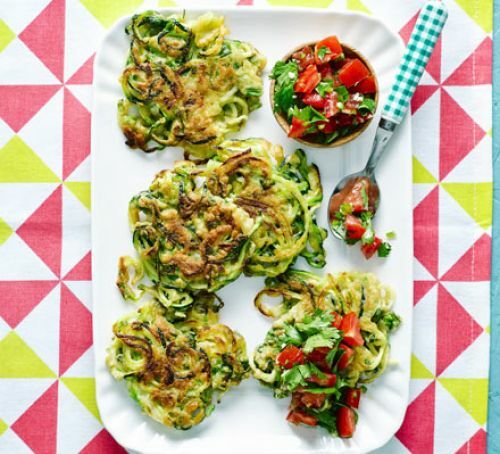 In a separate large bowl, mix together the spiralized courgette, coriander stalks, lime zest, cumin and flour (you may need to cut some of the longer courgetti in half). Stir in the beaten egg and season with salt and black pepper. Working in 2 batches, heat half the oil in a non-stick frying pan over a medium heat. Shape the fritters with your hands then then fry for 2–3 mins on each side until golden. Serve warm with the tomato salsa.